As a football fan there are few things that make you feel older than seeing the son of a former player who you remember clearly emerging and making an impact on the game. At the moment the likes of Tom Ince, son of ex-England international Paul, is an established first team player whilst over in Italy Federico Chiesa, the son of ex-international Enrico, is now part of the first team player with his father’s ex-club Fiorentina. The most exciting of the new generation however may well be the son of former Dutch international striker Patrick Kluivert who is making an impact on the first team at Ajax. Justin Kluivert is a very different player to Patrick but he does possess some of the same footballing characteristics. He is not a traditional striker preferring instead to play from either wing but with the freedom to move inside or outside as he sees fit. Kluivert has been highly rated for a long time within Ajax but it is only in recent weeks that he has made his first team breakthrough. In a relatively short time however he has convinced the passionate Ajax support that the club has produced another superstar in the making. Possessing great pace and quick feet the young winger has already displayed the ability to play in tight areas or in space with the control and technique that are expected from a graduate of the Ajax academy. He also displays the determination when he loses the ball to quickly counterpress and win the ball back. Indeed, he seems to have the same resolute characteristics that his father displayed throughout his career. There are still areas of his game that he needs to build upon in particular in the established defensive phase when he can occasionally be rash in leaving his defensive position and with his decision making in the final third where he still chooses the wrong option from time to time. These are areas however that should improve as he gains more experience at first team level. In 2010 the great Johan Cruyff grew so dissatisfied with the situation at Ajax that he decided to instigate a revolution that would become known as the “velvet revolution.” This led to ex-players of the club being installed at various levels of the club from the boardroom to the technical staff in a bid to reinstall what had become accepted as the ‘Ajax way’ of playing the game. There was greater emphasis on creativity and technical ability in one on one situations in the youth teams as the club looked to produce players that could play in tight areas with confidence and ability. Eventually Cruyff walked away from the club angry that too many people were unable or unwilling to follow his vision to the extent that he expected. The ideas had taken root however and one of the biggest benefactors was the young Justin Kluivert. When he faces an opponent in a one on one situation his balance and quick feet are such that he can go in either direction equally well, this makes him a huge problem for fullbacks. 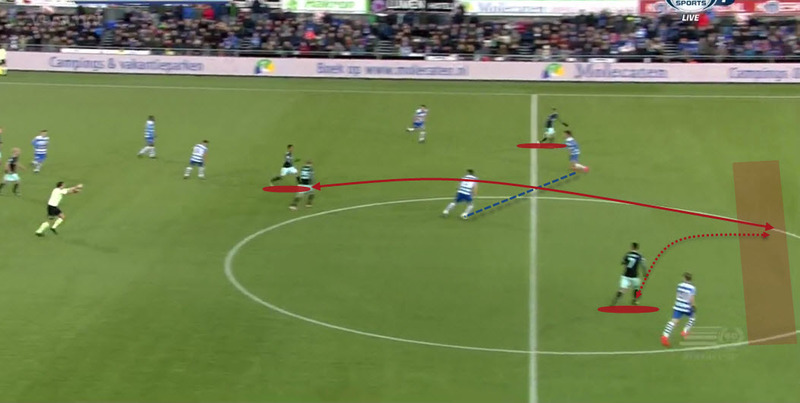 Here Kluivert has possession out on the right hand side of the pitch. As he progresses up the field he is faced up by the oppositions fullback. In the first instance the fullback is positioned to force Kluivert outside and prevent the ball from being cut in to the central area. The aim of the defender is to push Kluivert outside before closing the space and pressing him to the touchline preventing him from getting free. Instead Kluivert takes advantage of the fact that the defender is over committed by faking a quick move inside in the first instance. This forces the defender off balance as he goes with the fake and tried to adjust his position accordingly. As the defender is off balance Kluivert switches focus and bursts down the outside. With the defender off balance he is unable to squeeze tight in to Kluivert who gets free and moves inside towards the penalty area. As well as being able to identify and exploit areas of space in the opposition half Kluivert is also very effective in moving through tight areas. Here with the ball positioned at the corner of the penalty area Kluivert is faced up by three opposition defensive players with two immediately closing on the ball and one other in a cover position. He displays great confidence as well as quick feet in quickly slipping the ball through the legs of one defender before darting through and beyond the three defenders to threaten the opposition goal. As well as being comfortable in the wide areas Kluivert is also confident when playing in a more central role. Indeed, eventually I believe that the young attacker will become either a number nine or a number ten where he will be able to use his creativity to its fullest effect. When he does cut in to the central areas he has the ability to quickly identify the best passing option based upon the space available in the oppositions half and the movement of players ahead of him. Kluivert is so good at passing through the defensive lines of the opposition that he could profile as a deeper central midfielder. 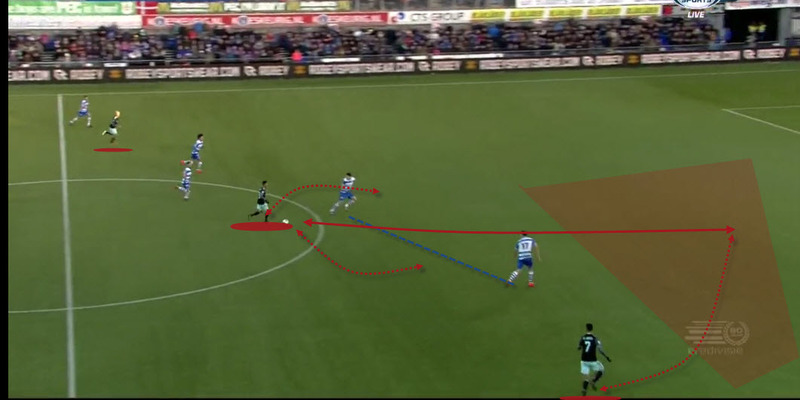 Here Kluivert is running with the ball in the central areas of the oppositions half. There are two defensive players still between his position and the goal and they have split to cover the passing options open to him. With his aforementioned ability when dribbling the ball in to space the defenders have to respect the threat that Kluivert will simply look to drive towards goal ignoring the passing option. As such the defenders are essentially in two minds and unable to commit to either closing down Kluivert or covering the advancing attacking players. The young attacker is able to draw the defenders further towards him before playing the ball through the defensive structure in to space for his teammate to run in on goal. On this occasion Kluivert has just taken possession of the ball with his back to goal before turning and twisting his way through three players who were looking to close him down. As he advances up the field he is quickly able to see the open space as the opposition defensive structure is poorly set up. As he advances forward he waits for the advanced player to make his first run before splitting the defenders with a through ball that allows his teammates to advance on goal. When he gets a chance on goal in a reasonable position there are echoes of his father in the way that Patrick Kluivert is able to finish in a composed manner from a variety of angles. Unlike his father, Justin is capable of creating his own chances through runs from deep areas. Here Kluivert is in an advanced central position as a high vertical pass is played up to him. He has the technique and the presence of mind to cushion a simple pass back to a supporting player in a deeper position. Here is where many lesser players would remain static expecting a pass back to feet. Instead Kluivert is instantly on the move showing his turn of speed once again to burst through the oppositions defensive line while the player in possession is able to play a relatively simple through ball in to space knowing that Kluivert will be able to get on the end of it. As Kluivert breaks through the defensive line and picks up the through ball his pace over the first ten yards carries him away from the defenders and in to the oppositions box. When he gets in to this area however it is the composure that he possesses that allows him to finish so simply in to the corner. Despite the defenders closing in and the goalkeeper tightening the angle the young forward simply slots the ball in to the far corner shooting across the face of the goalkeeper. A finish that was eerily reminiscent of his father. The next step for Justin Kluivert is to cement a regular place in the Ajax first team picture. From there we should see the youngster go from strength to strength as he gains experience and becomes more tactically competent. Could Pecchia be the first Serie A’s casualty?